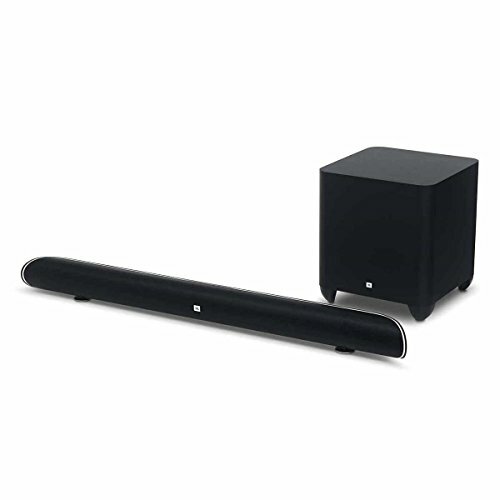 4K Ultra-HD Soundbar - Works seamlessly with 4K Ultra-HD displays and devices. (Features High Dynamic Range (HDR), HDMI 2.0a and HDCP 2.2). 8-inch (200mm) 200W Wireless Subwoofer - Deep bass with adjustable subwoofer volume control. 3 HDMI Inputs / 1 HDMI Output (ARC) - Connect up to 3 devices to the soundbar and one seamless connection to your TV. Clear Dialogue and Voice Enhancement: Hear the dialogue in movies more clearly without changing the volume. JBL SoundShift: Allows you to instantly switch between sound from your TV and sound from your phone or tablet. Virtual Surround Sound: Experience virtual surround sound without additional wires or speakers with Harman Display Surround. Wireless Bluetooth Streaming: Wirelessly connect smartphones or tablets to the speaker. Play audio with vibrant, room-filling sound.